Ensuring the quality of air supplying your respirator is made simple with the Barricade Carbon Monoxide (CO) Monitor. The Barricade will detect Carbon Monoxide levels less than 1 part per million (PPM) and alerts you with a 105-decibel audible alarm and visual indicator when it exceeds the allowable level. The Barricade is equipped with an easy-view LCD screen that displays the amount of CO present in the air. The unit can be powered with 12 Volt DC or 120 Volt AC. If you are working far from the unit, up to 250 feet, utilize the optional remote Strobe and Alarm. The unique Alarm Silencer allows for temporary quieting of the audible alarm for up to 4 minutes. 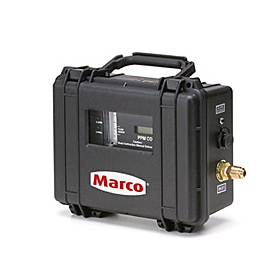 This gives you time to investigate the source of the CO but never disconnects power to the instrument.